Merlonghi began in 1923 the the construction of an auxiliary motor. 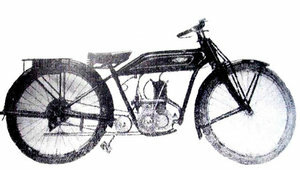 In 1924, attempts to increase their market beyond the regional level, they participated in the Salone del Ciclo e Motorcycle in Milan. A Normale: engine two to three trmpi lights 50x50mm, equal to 98cc, an Eisemann magneto and a Longuemare carburetor . Type stronger at the edge of displacement taxes, 52x62mm, equal to 132cc, cone clutch, gear lock in a 2-speed transmission chain, cone clutch and front fork parallelogram. The Carter and patented the system for their estate. 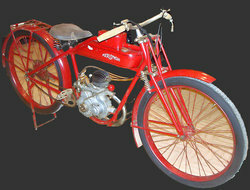 In 1926 continues the production of motor bikes and reach a million.